← Searching for Love? Why? Moving on from the past can be difficult to do, but it is so necessary that we do— if we truly want to live a full life. Staying in the past, keeps us on the same path, and in the same negative cycle, that victimizes our minds, memories and thoughts of what was, while shaping and bringing forth the same of what is, and incurring the same horrid results again and again. The past will never let us go, we must let IT go. When we hold on to the past, it is like we are fighting against the present and denying ourselves of the future. If we do not move forward, it shows we are incapable of solving our own problems and resolving our issues. We are showing little capacity to forgive, not only of ourselves, but others. It implies, we would rather hold on to pain rather than healing. It denotes we prefer stagnation over growth. We hold grudges and are inflexible. Our heart is closed to Love, and our perspective is limited, rigid, with minimal possibility for adapting and being open to change. Is this someone we want to be involved with? No! This is way too much maintenance. This person has a lot of baggage and he/she will drag that right into the relationship. Having this person in a relationship, would mean remembering all of the arguments, never getting over the mistakes, and having a hard time accepting “I’m sorry”. Improvement would not be possible, as this person would always import the past into the present in a way that hinders growth. There would be minimal understanding, because their past anger and pain shapes their negative perceptions of most situations. Talking about being set up for relational failure? Hell yea. Signing up to be with someone who is still in the past, means we are also signing up for doom, stagnation and misery. There is practically no possibility this person can intimately, emotionally and mentally commit, because their allegiance is with the Past. He/she is faithfully preoccupied and already taken (still) by being stuck in yesterdays. Not quite the partner we need in our lives. Others live in the past a little differently. Their handling of the past bears a different type of intensity. They appear to have it together. Have good people skills, and a likeable personality. They are fully functioning. If they are aloof, this can be perceived as arrogance, yet they are unpredictable, because if we say the wrong thing or do anything that resembles his/her painful past, we risk sudden anger, a shut down, a verbal attack and we are looking in the eyes of a person that is very unfamiliar from the person we have come to know. This can be disturbing and very unsettling. It is like walking in the mind of a human minefield. This unfamiliar person who comes to the forefront is stubborn, unapproachable and unreachable. We are faced with the angry gatekeeper of that person’s past, who can come to the forefront at anytime, depending on our actions. Dealing with the painful past dead-on is the opening of the portal to moving on from the hurt. Resolving pain helps us to find peace. Having the courage to take ownership of what we have done and how we have failed, is the beginning of change. Forgiving the person who has done wrong is the start of us living again. Forgiving ourselves sets us free. Working through anger, helps to remove our fear. Thinking ahead and seeing ourselves existing as a different person, gives us hope to get there and helps to shape us to be the person we envision. Knowing that our past experiences serve as a teacher and guide of what works and what does not work. Taking the bad moments and extracting any good from them, gives us a different perspective on life. This is the beginning of healing and moving forward. We should view our past as we view our history. It is to be remembered in the light of who we were, what we have become, and what we can be. It is to be honored when appropriate, identifying the lessons we’ve learned for self improvement, celebrating our victories, laughing when we reflect on the funny moments, and refraining from the painful mistakes, careful never to repeat them again. 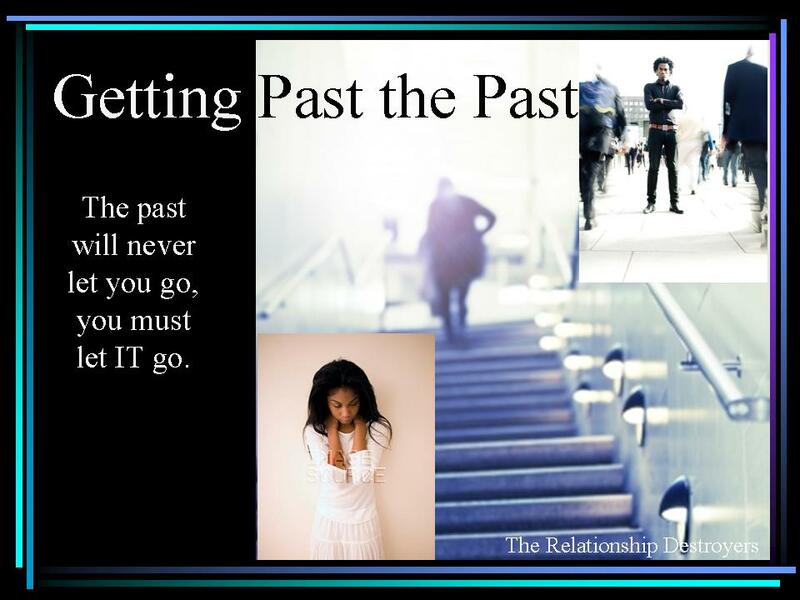 Be the best person you can be by resolving and overcoming your past. This entry was posted in Self and tagged A painful past, Getting over the past, relationship with a partner who has a painful past, The past and the pain. Bookmark the permalink.